As The World Watches, Mandela Is Buried In His Humble Village : The Two-Way Under a sunny African sky, Nelson Mandela was buried Sunday on a hill overlooking his beloved boyhood village. Members of his clan, national leaders and a global audience bid farewell to the man who transformed his country and became one of the world's most revered figures. The coffin of South African former president Nelson Mandela is brought on a gun carriage for a traditional burial during his funeral in Qunu on Sunday. Under a sunny African sky, Nelson Mandela was buried Sunday on a hill overlooking his beloved boyhood village. Members of his clan, national leaders and a global audience bid farewell to the man who transformed his country and became one of the world's most revered figures. The burial marked the culmination of 10 days of mourning and tributes to Mandela's remarkable journey, which began and ended in Qunu. Home to a few hundred farmers, the village is little-changed since Mandela's childhood. Nelson Mandela's casket was escorted to the funeral service by senior members of South Africa's military. Traveling a dirt road, a military procession ushered in Mandela's flag-draped casket, about an hour before the formal service was to begin. 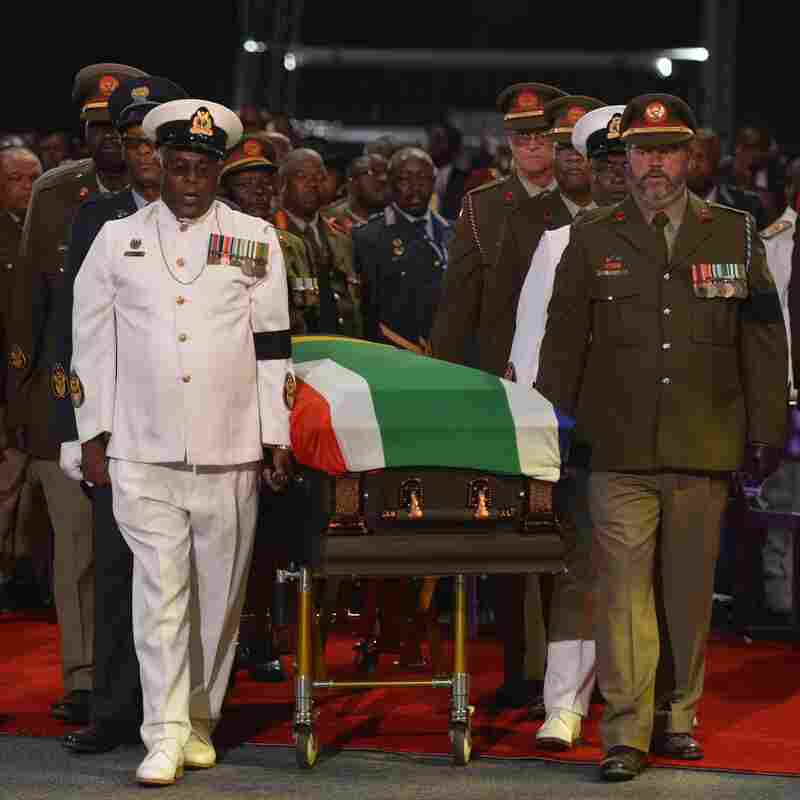 Senior members of the military — the military that once battled Mandela's African National Congress — served as pallbearers. A gun carriage transported the casket, while personnel from the various military branches marched in front and behind, and also lined the route. A band played. Cannons fired. "Today, I think we can all agree, the person who lies here is South Africa's greatest son," Cyril Ramaphosa, the deputy president of the ANC, said at the funeral service. Ramaphosa and the other speakers appeared on a podium with Mandela's casket in front of them. Behind them flickered 95 candles, representing Mandela's age. 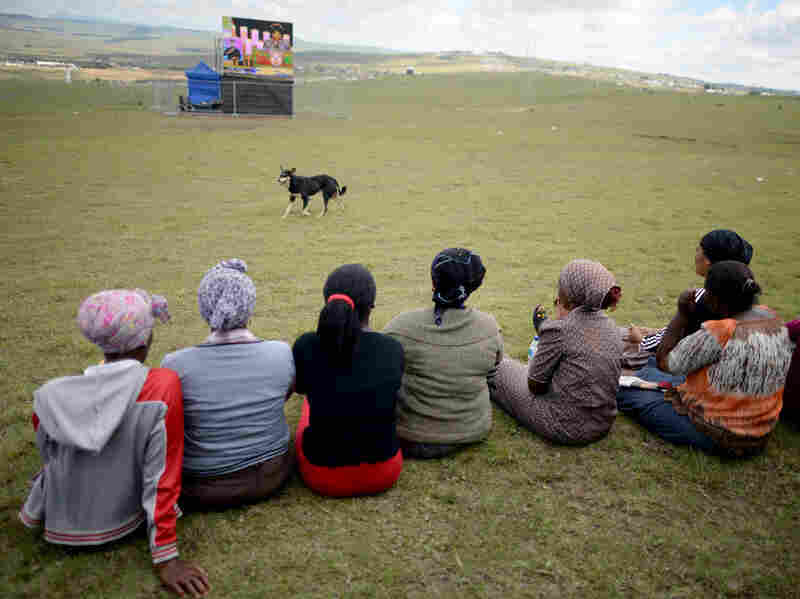 Because Qunu is so remote, South African authorities this past week swiftly erected a temporary pavilion to host the more than 4,000 mourners. From the inside, the pavilion provided a modern, polished venue for a formal, dignified ceremony. From the outside, it resembled a white bubble placed among the cow pastures and modest village homes of South Africa's Eastern Cape region. The funeral was both a global, public event televised around the world and a local, private ceremony. Speakers included a clan leader with a leopard skin draped over his suit who spoke in Xhosa, Mandela's first language. One of the most moving tributes was delivered by Ahmed Kathrada, who knew Mandela for nearly seven decades as a fellow prisoner and ANC leader. Ahmed Kathrada knew Mandela as a longtime fellow prisoner and ANC activist. 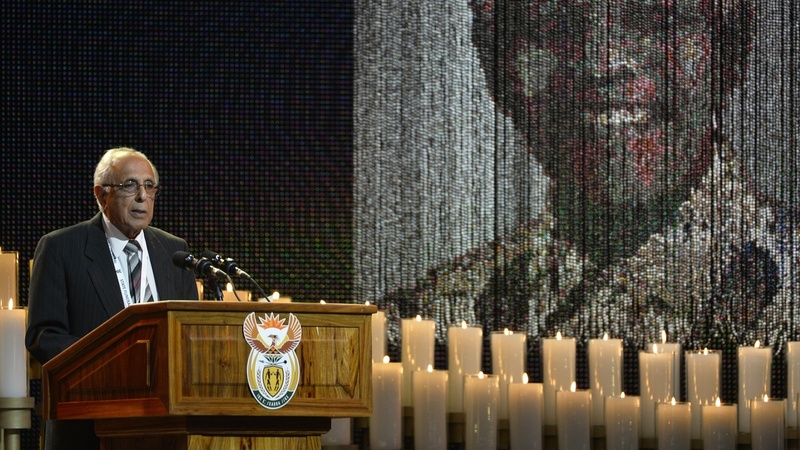 He spoke of Mandela and another ANC leader, Walter Sisulu, who died a decade ago. With both now dead, he said, "My life is in a void. I don't know who to turn to." Kathrada, who spent 26 years in prison — compared to 27 for Mandela — joked that he "got a discount." 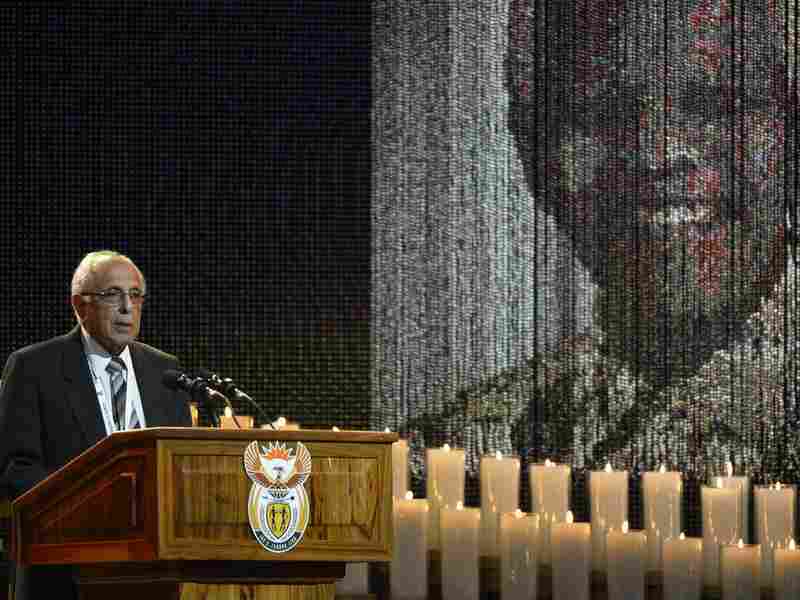 "Today, mingled with our grief, is the enormous pride that one of our own has, during his lifetime, and now in his death, united the people of South Africa and the entire world," Kathrada said. His voice cracking at times, Kathrada described another ANC leader, Walter Sisulu, who died a decade ago, as his father, and Mandela as his older brother. With both now dead, he said, "My life is in a void. I don't know who to turn to." South African President Jacob Zuma, who was repeatedly booed by the large crowd at Mandela's memorial service on Tuesday, received a more generous welcome Sunday. "We have to keep building the type of society you worked tirelessly to construct," Zuma said. "We have to take your legacy forward." While Zuma received polite applause, another president received a standing ovation: Malawi's Joyce Banda, one of the few women who has headed an African nation. Banda said that after an assassination attempt, she tried to emulate Mandela by working with her enemies and not holding a grudge. Though mostly solemn, the service also included singing, laughter and moments of lightness — some of it provided by Kenneth Kaunda, the 89-year-old former president of Zambia, who jogged to the podium in a stiff-legged shuffle. When an organizer told him to wrap up a speech that was running long, Kaunda responded, "All right, young man, I'm going to end this soon." Mourners included the country's elite, royalty and political figures from around the world. Mandela's ANC comrades entered the grounds singing and dancing to celebrate the nation's former president. 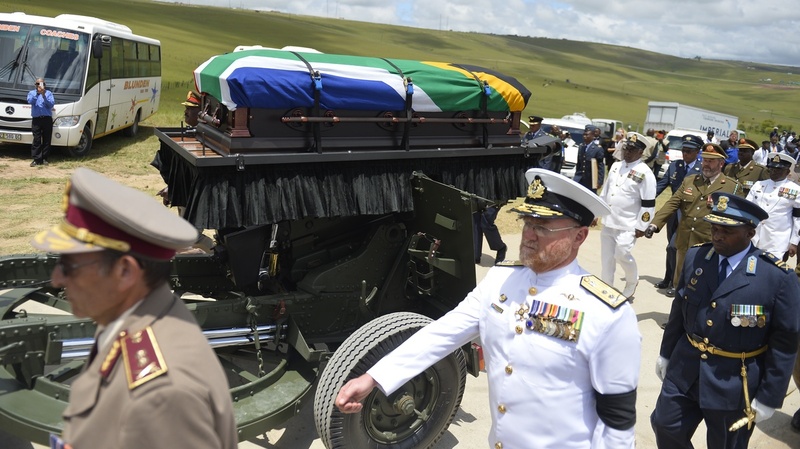 After placing the coffin for burial, the military withdrew, along with the television cameras, honoring the Mandela family's request that the burial itself be a private affair limited to family members and friends. The events since Mandela's death on Dec. 5 have gone smoothly for the most part, though there have been a few hiccups. A brief controversy erupted Saturday when it appeared that the Archbishop Emeritus Rev. Desmond Tutu, a close friend of Mandela and a fellow Nobel Peace Prize laureate, might not attend. Tutu said he had not received an invitation, but organizers said there were no formal invitations sent out and that he was on the list. In recent years, Tutu has been sharply critical of Mandela's African National Congress over issues such as corruption. However, the dispute was quickly resolved and Tutu arrived in Qunu early Sunday morning, some two hours before the service. Britain's Prince Charles, businessman Richard Branson, U.S. civil rights figure Jesse Jackson and Oprah Winfrey were also among those paying tribute to Mandela on Sunday. Mandela, who was born the year World War I ended, spent the first few years of his life about 20 miles away from Qunu, in the village of Mvezo. His father was a tribal chief with four wives, but a white judge stripped his father of his position in a dispute over an ox, and the family settled in Qunu. Large video screens were set up around the village of Qunu for the more than 4,000 mourners who gathered for the service. Mandela ran barefoot in the hills, tended cattle and sheep, and learned traditional stick fighting in a place full of fond memories. "I learned how to knock birds out of the sky with a slingshot, to gather wild honey and fruits and edible roots, to drink warm, sweet milk straight from the udder of a cow, to swim in the cold, clear streams, and to catch fish with twine and sharpened bits of wire," Mandela wrote in his autobiography, Long Walk to Freedom. "It was in that village near Umtata that I spent some of the happiest years of my boyhood." Mandela left Qunu to go to college and to avoid an arranged marriage. Thus began an extraordinary journey in which he would become an anti-apartheid activist, the world's most famous prisoner, the country's first black president and one of the most venerated global figures of the past century. After he retired from public life almost a decade ago, Mandela built a retirement home in Qunu. That house, a small Mandela museum and a few gravestones with the names of Mandela family members — including three of his children — are among the few signs that distinguish this village from any other in South Africa.